You may not immediately recognize David Oyelowo's name as you might Terrence Howard's or Cuba Gooding Jr.'s, but he plays the lead in the hit Red Tails, which opened at No. 2 at the box office this past weekend. Oyelowo also stars in Ava DuVernay's upcoming Middle of Nowhere, which premiered at the 2012 Sundance Film Festival this week. The English actor, who had to adopt an American accent for both films, is no stranger to the business. With several big-time projects in the hopper — including Lee Daniels' The Paper Boy, One Shot with Tom Cruise and Steven Spielberg's Lincoln — his name will be everywhere soon enough. 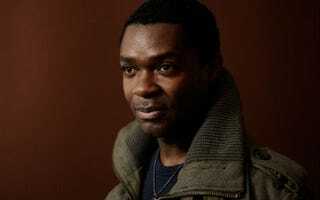 The Root talked to Oyelowo about Sundance and the controversy surrounding Red Tails. The Root: How do you feel about being at Sundance with Middle of Nowhere while Red Tails is opening? David Oyelowo: What I really love about this day I'm having is that you have Red Tails on the one hand, a big blockbuster [with] George Lucas executive-producing it, and here is an independent film we made for very little money that I also love. I truly believe that where longevity lies for an actor is to mix it up, to surprise the audience and to support smaller films and try to get into bigger films. I feel very happy. TR: How does it feel being an English actor playing all these American roles? Are there no roles for you in the United Kingdom? DO: There are roles for me over there, but the fact of the matter — where America is different from the U.K. — is that America has a very clear undeniable black history, and that for me means you cannot be part of the artistic Diaspora without acknowledging that fact. People [in the U.K.] can make Jane Austen movies and not have black people in it — you can't do that here. Just means that as black people here in America, you get to be in more stories. TR: How did you end up getting these two lead roles? DO: With Red Tails, I fought to get in the room, auditioned and thankfully they wanted me. With Middle of Nowhere, one of the producers approached me on a plane, told me about the project, sent me the script. I loved it; I called Ava DuVernay. TR: What is your impression of George Lucas' comments about how hard it is to get a black action movie like Red Tails made? DO: I think for him, he thought, he's George Lucas, he's Star Wars, he's Indiana Jones. For him to get a movie off the ground — to get the studios involved — should not be a problem. But he was surprised that they were reluctant. That made him realize the struggles black filmmakers must have if he's struggling to get a film off the ground. Julie Walker is a New York-based freelance journalist. Follow her on Twitter.